The Leadership Zone Book - WE ARE HERE TO SERVE YOU! CALL US WHEN YOU ARE READY! We are all born to be leaders, but as a result of upbringing our parents, schools, religious institutions and community build barriers around us, initially to protect us from the harm out there. These barriers, mostly invisible, create a kind of fortress to protect us. But as we grow up the fortress become a prison and the barriers prevent us to reach our full potential – our zone of excellence or the leadership zone. As such most of us languish in mediocrity, resent those who have made it, justify our situation by finding lame excuses and blaming others for out lot. The Leadership Zone shows us how these invisible barriers and the mindset of scarcity are created and how to break through them once and for all. It provides us with the tools to overcome these self-sustaining obstacles and take full control of our destiny. It guides us in our journey to our Zone of Leadership – a zone in which we perform at our level of excellence and lead a life by design. It shows us the roadmap to a happy, healthy and wealthy life! It also shows us that once we break through our prison, what we need to do to sustain our freedom and not slide back to that prison of mediocrity. Invisible barriers are preventing you from reaching your full potential even if you think otherwise. By becoming consciously aware of these barriers however, you can break through the cycle of mediocrity and victimhood. You can get rid of the paradigms of scarcity and live in a state of abundance. You can expand your circle of influence and make a difference in your own life and in the lives of those around you. Take control of your life and unleash the leader within you! Learn how in becoming a better and greater version you – you become the leader you are destined to be! Use Your Reality Loop and design your environments to inspire and support you. Communicate effectively by understanding the laws of communication and the Human Needs. Inspire trust and extend trust to others. Differentiate between Leadership and management skills. Discover your passions and live a passionate life. Learn and use the formula of Your BEING x Your DOING = Your OUTCOME. Complete your past and deliberately design your future. Be responsible for a Happy, Healthy and Wealthy you. Set and achieve SMART goals. Become the person who leads from the zone – the leadership zone, where you thrive rather than strive. The Leadership Zone is so rich in content that all the above claims are quite applicable. It contains all personal-socio-economic demographics. From personal barriers to health and wellness, from leadership environment to the stress management, in short; from ground zero to goal setting and achieving. This book covers all personal needs to change in an elegant, chastity and profound words, quotes and insights, even homework sheets to keep practicing in order to unfold all the hidden barriers and egos. “Hello Mr. Duranai, I'm just reading your book THE LEADERSHIP ZONE. “Congratulations on the great book. I just finished reading it from beginning to end . 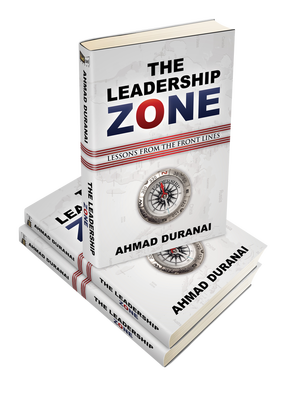 To order hard copies of the book, The Leadership Zone, click the ﻿Buy ﻿Now button below. ​The Leadership Zone Book is a holistic manual for leadership.